The Fight starts! Shouma is able to make 2 damages to Shion! Now it´s Shion´s turn and he starts remembering that day, when he was humiliated by Ace and his life went downhill, he lost his honor, pride, family, house, future, everything… And everything was a trap from this Guy… Shinonome Shouma! Shion manages to make 3 damages to Shouma… Which is enjoying this a little too much. Shouma turns starts and he is using the “Revelation” Skill, which is to look a the next card of your deck and decide where to put it. Shouma talks how proud he is of himself right now… Since he took out Shion of his protective world of rich guys and threw him in to the wilderness, which awoke Shion´s own wild instincts, and how the more time Shion fought those wild instincts were being more and more visible. Truly wonderful! Shouma attacks and manages to put Shion on the ropes with 5 damage! Shouma laughs and say that he is the one responsible to raise him to the state where he is now! Shion´s turn starts and he brings his G4 Card! Shion has enough of Shouma´s twisted logic! Shion makes some awesome moves giving more power to his units and attacks! Now it´s Shouma´s turn… who says that Shion is right now in the future he envisioned…The paradise of Desperation, where Shouma will become in his Guardian Angel. Shouma brings his G4 Card and souls charge! While making his moves, Shouma Ask Shion… What does it means for him to be a Kiba? It´s his family? His history? The Company monster? The CEO Seat? Shion doesn´t respond. While attacking (and making a lot of good moves) Shouma says that right now, he has all of that, he is the leader of Kiba and has everything Shion had… And he can happily give it back to him, if he asks. Shion doesn´t responds to the passive-aggressive talk of his enemy! The moves Shouma does are very good! Still Shion manages to survive! Shouma basically says that he is making his role of Guardian Angel right now, since when he has defeated Shion and the Perfect Future comes, everything will be fine for him! Shouma´s turn ends and now its Shion´s! Shion reject such Future and says that he will grasp by his own hands his own true future! Shion brings his G4 card and makes his moves, which basically re to give more power to his units. Shouma continues talking saying that all of this is what he sought in the future… Still there are fluctuations that can alter the end result in everything… And his future is no exception, and for that he is amazed! Shion is the perfect embodiment of everything he wants! That perfect future he has sought truly brings him joy! Still… Looking how the fluctuations can tear it apart such future brings him an equal amount of joy! Shouma is filled by joy with that! And by seeing Shion struggling! Shion´s turn ends without making any damage to his opponent. Shouma starts remembering when he meet Shion at the Regional tournament, when Shouma wiped the floor with him; then when Shion beat him at the exhibition match in the United Sanctuary… He is filled with joy and excitement at seeing how Shion fights, struggles, falls, raises and soars! He doesn´t care anymore about Ryuzu´s Ideal future! He just wants to keep seeing how Shion struggles and fights, changes the result, and still the big plan prepared for him keeps going strong! This is joy, this is bliss for him! Shouma brings his G4 Card! Whose skill is that changes the effects of the “Revelation” skill! Man Shouma´s moves are top notch right now, by playing with the soul and the deck, using the Revlation skill and everything he truly has amazed a big quantity of power!! 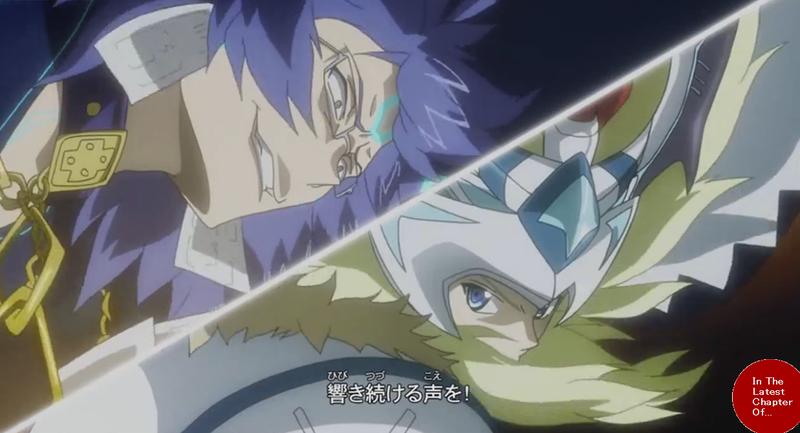 Now Shouma attacks hoping for the future he envisioned to Shion to come! Shion look at his hand, Shouma asks if Shion won´t block? <<<I´m going to check the Cards in your Drop Zone and Soul>>> a strange petition, although not illegal, one is free to check the opponent cards that aren´t in the deck or in the hand. …Shion has decided to not to block, and if he manages to survive he then can block easily the next attacks. Here comes the Drive checks… 1st…No trigger. Man one can feel how Shion was able to breath after that! In the damage check Shion gets a Critical Trigger! Shion blocks the next attacks of Shouma! Shion starts saying some truth bombs to Shouma… How he is pathetic, he likes to brag about seeing the future and look down on everything; but the truth is that he is just a Bystander, someone who does nothing for himself and isn´t able to keep going forward! Unlike him, Shion has faced desperation, joy, hope, betrayal, happiness and sadness, compassion and hate, all of those feelings and experiences he has grasp them and lived them! He doesn´t need any future prepared for him, since he is able to grasp it and made it by himself! Shion continues and says that is who Kiba Shion is and grasp the sword!! The Sword starts shinning! Now Shion is the true king of England…I mean he is a true worthy of the legendary weapon! A card has appeared. Blazing Sword, Fidel. Shion brings him into play! Shion can feel the will and desire of everyone, in both Cray and the Earth, everyone rejects the “Perfect Future”! Shion attacks! Shouma doesn´t guard since he has 4 damages, he can take one attack if he wants. Shion´s triggers brings a Critical one! He and everyone will shatter the fake future and bring a true and brighter one! And it will be by their own hands! Shouma is amazed… Still, he starts laughing like a Madman, seeing all of this it´s his greates joy ever! He basically says that Shion´s tale is one worthy to be called an Epic poem! Like the Knights used to have! Still… The funny thing is that this is the same future he sought. Shouma keeps on laughing like a madman, without realizing that something is about to fall on his head, a pillar, and a big one at that, he notices; but it´s too late and he can´t escape! Shion has saved him… Shouma sees it and starts laughing, saying that truly Shion is a piece to behold. He gets closer to where Shion is and tells him to get up! To quit acting and get up! There it´s still too much fun and joy he can bring it to him! Shion doesn´t respond, no matter what Shouma do or says… he doesn´t responds. Subconsciously, Shouma know the truth. Shouma starts saying that this must not be happening! He demands to Shion to get up already! Behind Shouma… The whole place starts to fall apart. Shouma yells while crying. In a matter of seconds… Everything above him falls. More Deaths?! Man things are getting edgy and dark this time! Still, the chapter was very good and I liked a lot of the moves that Shion and Shouma made. Man that Shouma truly was full of himself until the end…Of course until he sought that Shion is death now… Still Shion threw him some truth bombs to Shouma, that he is only a bystander, someone who truly will never do anything by himself… Still that Shouma was truly Yandere for Shion. Man those last parts where truly believable and top notch since Shouma didn´t wanted tof ace that Shion, who was his whole world, now didn´t existed anymore and he fell into a big desperation in the last seconds of his life. Continuing, man now I am afraid on what will happen to Tokoha, Am and Luna (I don´t care about Enishi :P) since I can see some, if not all, of them biting the dust now! Going back to this combination of Shion and Shouma… Man this was truly a complex and awesome relationship all the way through, now that´s something amazing and Shouma was a great villain for sure! Also it was amazing how he fall into desperation in his last seconds, after seeing him with his smug face during all these years! Still it´s sad that Shion is Dead, there are some hopes that he might get revived though (because reasons and magic) Still… If this is the end for both of them, at the very least they had somewhat of a satisfying ending, not the best one or a happy one; but a satisfying one at that.